The widely held definitions of the word “reputation” point to the fact that reputation is all about ‘opinion’ or ‘estimation’ about someone or something by somebody. As they say, “you can mean something to somebody but not everything to everybody”. This hold true for corporations, institutions, political entities and even individuals. Who is this somebody whose opinion matters to us? What is the opinion or estimation that they really have? What has led them to this opinion? What would help strengthen/modify their opinion? “Defining The Persuables”, an approach which goes beyond the classical stakeholder segmentation. The answer itself comes from the definition of the word ‘reputation’. With the involvement of opinions and estimation of someone held by somebody, we can safely presume that different constituencies will have their own interpretations and opinions and estimations would be divided. Stakeholders can be many and of different types for a company, employees and potentials, customers, partners, investors, etc. and for politicians, voters and influencers across demographics, it may be caste, faith, economic and social standing and so forth. Is it sufficient to put labels to the stakeholders? A good first step, but not enough, because, it only partly answers the question: Who is this somebody, whose opinion matters to us? Once we have a good definition in place, we need to take the next step, to understanding our audiences’ knowledge, believability and favourability, which in turn leads us to their current opinion/estimation and resultant, a new set of labels: Advocate, Agnostic, Sceptic and Adversary based on opinions/ estimations or simply what we call: Base, Swing and Reach audiences. 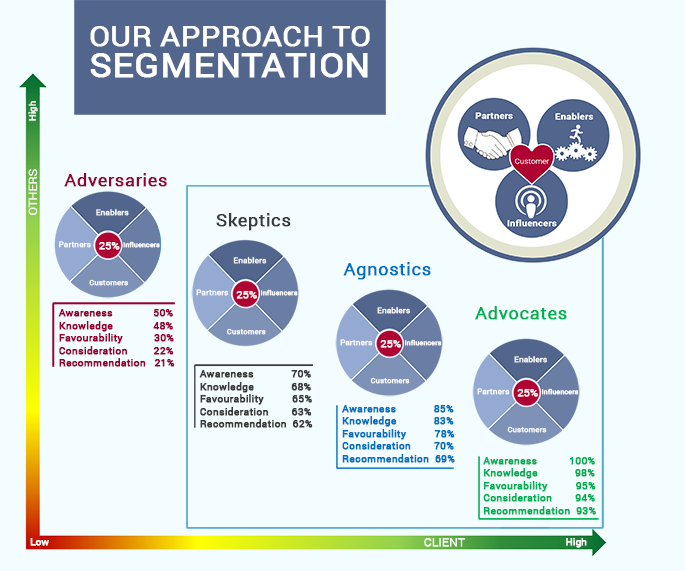 Integration of Segmentation Step 1 & 2 leads to a more focused reputation management strategy which helps identify, the advocates, who spread the good work, the adversaries, who we need to engage and those open to persuasion to become our supporters. “Defining the Persuable” is the Astrum approach, a holistic approach to identifying and engaging the specific and target audience, in the corporate environ or in politics and using Science to develop effective reputation management strategies is the Astrum way! Our 4D approach from Discover to Deliver puts science at the heart of creating persuasive communication and more effective reputation management campaigns. I realise that perhaps I have only answered one of the several questions I posed earlier that needs to be answered. There will be more on those, in times to come, as we explore the subject of science of reputation. This is not the future, this is the present, clients want these insights as it impacts the success of their business and reputation management firms would need to adopt this approach if they want a seat at the table in the board room. Think it over and join the conversation.